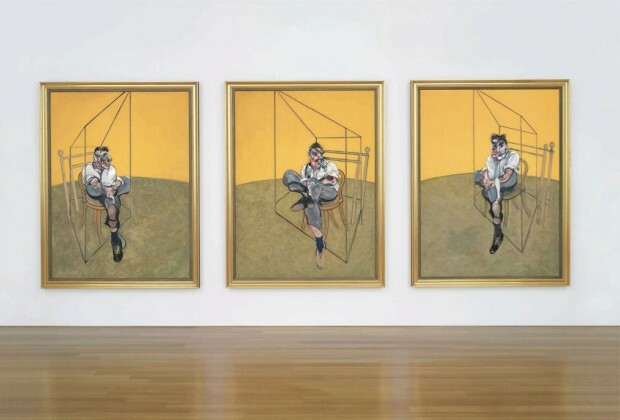 ☛ Christie’s: “Three Studies of Lucian Freud” by Francis Bacon, oil on canvas, in 3 parts, each: 78 x 58 in. (198 x 147.5 cm.). Image retrieved from Christie’s e-Catalogue (requires Flash), pp. 26-27. 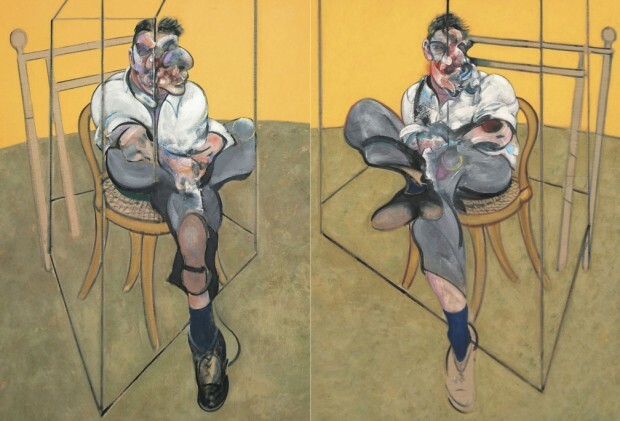 It took seven superrich bidders to propel a 1969 Francis Bacon triptych to $142.4 million at Christie’s on Tuesday night, making it the most expensive work of art ever sold at auction. William Acquavella, the New York dealer, is thought to have bought the painting on behalf of an unidentified client, from one of Christie’s skyboxes overlooking the auction. (The New York Times: “At $142.4 Million, Triptych Is the Most Expensive Artwork Ever Sold at an Auction” by Carol Vogel, Nov. 12, 2013). In short, the painting is composed like a circus ring, a kind of amphitheater as “place.” It is a very simple technique that consists in isolating the Figure. There are other techniques of isolation: putting the Figure inside a cube, or rather, inside a parallelepiped of glass or ice; sticking it onto a rail or strech-out bar, as if on the magnetic arc of an infinite circle; or combining all these means ―the round area, the cube, and the bar― as in Bacon’s strangely flared and curved armchairs. The are all “places” [lieux]. In any case, Bacon does not hide the fact that these techniques are rather rudimentary, despite the subtlelty of their combinations. The important point is that they do not consign the Figure to immobility but, on the contrary, render sensible a kind of progression, an exploration of the Figure within the place, or upon itself. It is an operative field. The relation of the Figure to its isolating place defines a “fact”: “the fact is…,” “what takes place is…” Thus isolated, the Figure becomes an Image, an Icon. LEFT: Photograph of Lucian Freud (detail) by John Deakin, circa 1964. 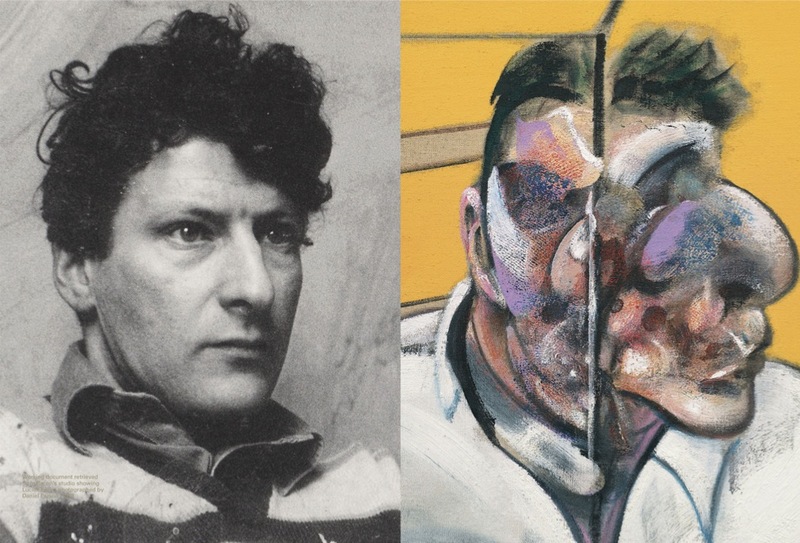 © The Estate of Francis Bacon; RIGHT: “Three Studies of Lucian Freud” (detail) by Francis Bacon, 1969. Image retrieved from Christie’s e-Catalogue, pp. 150-151. Not only is the painting an isolated reality, and not only does the triptych have three isolated panels (which above all must not be united in a single frame), but the Figure itself is isolated in the painting by the round area or the parallelepiped. Why? Bacon often explains that it is to avoid the figurative, illustrative, and narrative character the Figure would necessarily have if it were not isolated. Painting has neither a model to represent nor a story to narrate. It thus has two possible ways of escaping the figurative: toward pure form, through abstraction; or toward the purely figural, through extraction or isolation. If the painter keeps to the Figure, if he or she opts for the second path, it will be to oppose the “figural” to the figurative. Isolating the Figure will be the primary requirement. The figurative (representation) implies the relationship of an image to an object that it is supposed to illustrate; but it also implies the relationship of an image to other images in a composite whole which assigns a specific object to each of them. Narration is the correlate of illustration. A story always slips into, or tends to slip into, the space between two figures in order to animate the illustrated whole. Isolation is thus the simplest means, necessary though not sufficient, to break with representation, to disrupt narration, to escape illustration, to liberate the Figure: to stick to the fact. LEFT: Working document retrieved from Bacon’s studio showing Lucian Freud photographed by Daniel Earson, 1963; RIGHT: “Three Studies of Lucian Freud” (detail) by Francis Bacon, 1969. Image retrieved from Christie’s e-Catalogue, pp. 158-159. Clearly the problem is more complicated than this. Is there not another type of relationship between Figures, one that would not be narrative, and from which no figuration would follow? Diverse Figures that would spring from the same fact, that would belong to one and the same unique fact rather than telling a story or referring to different objects in a narrative whole? Nonnarrative relationship between Figures, and non-illustrative relationships between the Figure and the fact? Coupled Figures have always been a part of Bacon’s work, but they do not tell a story. Moreover, there is a relationship of great intensity between the separate panels of a triptych, although this relationship has nothing narrative about it. (Francis Bacon: the logic of sensation, tr. Daniel W. Smith, New York: Continuum,  2003, pp. 1-3). 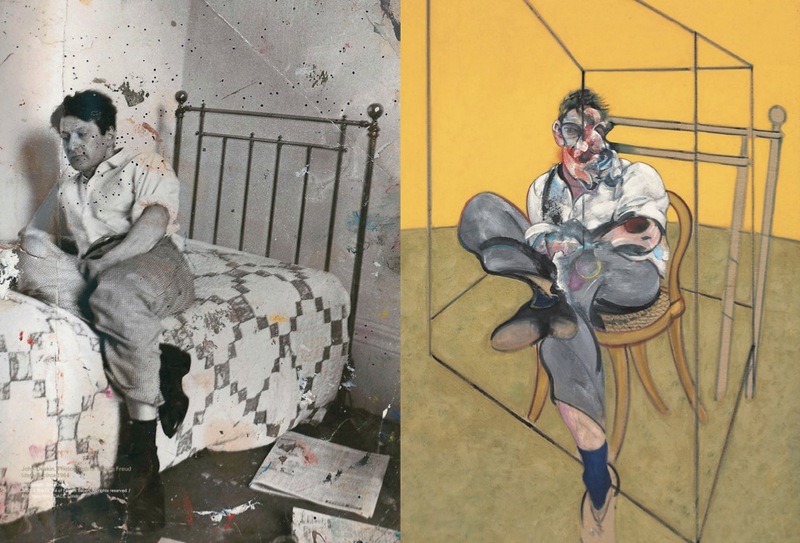 “Three Studies of Lucian Freud” (detail) by Francis Bacon, 1969, oil on canvas, each (unframed): 78 x 58 in. (198 x 147.5 cm.). Image retrieved from Christie’s e-Catalogue, pp. 56-57. Where Simondon underlines the fact that the advent of technological thinking also produces a “deficit”, McLuhan will evoke instead a “technological trauma” (previously). Although the works of Simondon and McLuhan greatly diverges on other points, here one could venture to suggest that McLuhan “split man” is also the result of a separation between figure and ground. In this regard, part of Simondon’s theory can be understood as an effort the think anew the relationship between figure and ground through a process of individualization that avoids the traditional reduction into clearly distinct unities (figure against ground). This would be one way to experience Bacon’s painting. His parallelepiped cage does not isolate a recognizable figure from a ground. Nor does it function as a traditional representation. On the contrary, it acts as a pictorial apparatus preventing such operations. In doing so, it allows the entire triptych to work as a field of sensation. In other words, instead of a painting representing Lucian Freud, there is paint, “on its own”, taking place (or presenting itself) as a Figure. 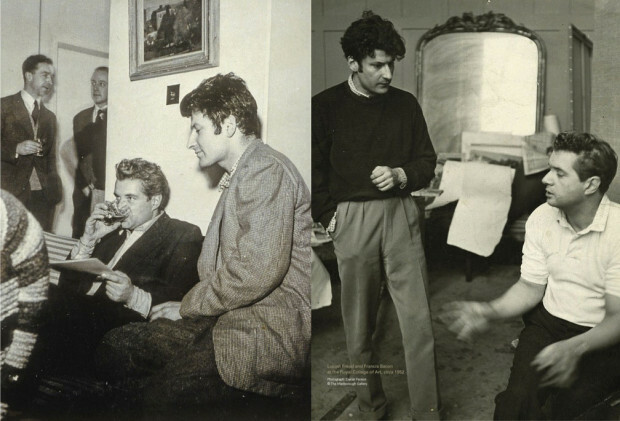 LEFT: Francis Bacon and Lucian Freud at the Royal College of Art, circa 1952; RIGHT: Francis Bacon and Lucian Freud at the Royal College of Art, circa 1952. Photograph: Daniel Farson. © Marlborough Gallery. Image retrieved from Christie’s e-Catalogue, pp. 54, 18.